The Syrian Arab Army (SAA) Tiger Forces have been further capitalizing from the airdrop operation conducted behind ISIS defense lines in the Homs-Palmyra countryside. 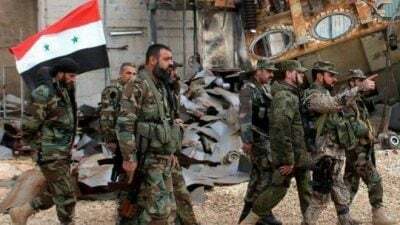 On Monday, the Tiger Forces liberated the villages of Bukhayran, Ariqah and Othmaniyah and then the entire Kawm oasis located on the road between Resafa and Sukhna. On Tuesday, government troops continued developing momentum in the directions of Bir Hisayyah and Taybah. Russian Ka-52 attack helicopters provide a close air support to the advancing government troops. According to local sources, Russian military advisers are involved in the operation. If the Tiger Forces capture any of the aforementioned villages, they will be able to threaten all ISIS supply lines in the area. This will decrease the ISIS defense capabilities in Uqayribat in the eastern Hama countryside. The Syrian military is very close to putting ISIS units north of the Homs-Palmyra highway in a no-win situation. In coming days, ISIS will counter-attack in order to slow down the Tiger Forces advance and to prevent encirclement of its forces. If terrorists are not able to achieve their goal, it may lead to a full collapse of the ISIS defense in the area. In eastern Damascus, government forces continued pressuring Faylaq al-Rahman and Hayat Tahrir al-Sham in Jobar and Any Tarma. Since the resumption of the operation in these areas, the SAA has made some tactical gains, but the situation remains complicated. Many will depend on the ability of militant groups operating in Eastern Ghouta to cooperate against government forces. The US-backed Syrian Democratic Forces (SDF) have faced troubles inside the city of Raqqah where the SDF is clashing with ISIS. Since Saturday, ISIS has conducted multiple counter-attacks in the eastern, western and southern parts of the city using VBIEDs, snipers and grenade launchers. According to AMAQ, about 50 SDF members have been killed in the recent attacks. However, this number sounds overestimated. The delay in the battle of Raqqah plays in to the hands of the Syrian military that seeks to liberate central Syria and to reach Deir Ezzor before the US-backed force.